Thank you very much for subscribing to SCUBA News: our complements of the season to you. I hope you enjoy SCUBA News but should you wish to cancel your subscription you can do so at https://www.scubatravel.co.uk/news.html. SCUBA News is published by SCUBA Travel Ltd.
Where are good dive locations off Pacific in January? We recommended Palau in Micronesia or Hin Daeng and Hin Mouang in Thailand. Anyone any other suggestions? E-mail news@scubatravel.co.uk or tweet @SCUBANews. We are a couple who love to snorkel so reefs need to be fairly shallow and close to a nice beach so we can enter from the beach. We have never been to Cuba before. Can you recommend a suitable area/place. Can anyone help Susanne? E-mail news@scubatravel.co.uk and we'll pass your message on. Coryphella browni. Photo by Tim Nicholson. 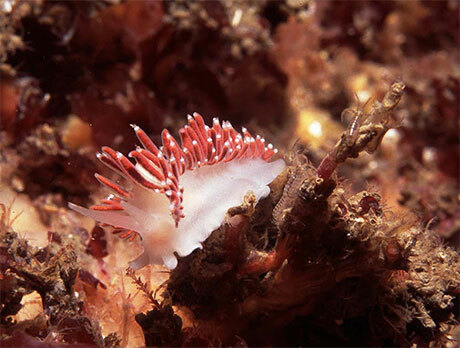 Coryphella browni, or the Scarlet Lady nudibranch, is one of the few animals to eat stinging hydroids, in particular the Oaten pipes hydroids (Tubularia indivisa). It not only doesn't mind their stinging cells, it actually puts them to use. The nudibranch passes the intact cells through its digestive tract and out to the cerata tips (the colourful projections on its body). Any animal taking a bite out of the cerata will discharge the stinging cells, then give up and go and eat something less painful. Coryphella browni with its favourite food the Oaten pipe hydroid (Tubularia indivisa). Photo credit: Tim Nicholson. 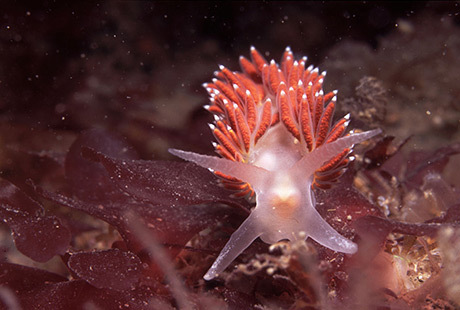 Coryphella browni has a translucent body and numerous red cerata with white tips. The inner cerata are longer than the outer. It grows up to 5 cm long. You find it around the British Isles and Northern Europe. 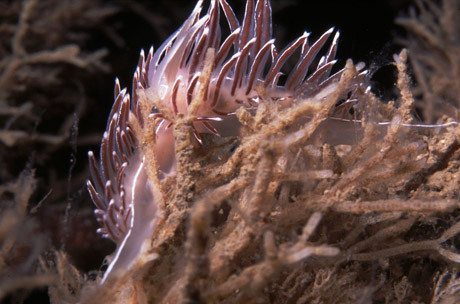 There are other species very similar to C. browni, such as Coryphella lineata which is distinguished by white lines down its body and along its cerrata. Coryphella lineata (above) is distinguished from C. brownii by the white lines on its body and cerrata. Photo credit: Tim Nicholson. 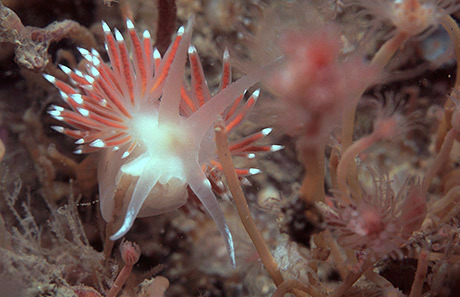 Nudibranchs are hermaphrodites: possessing both male and female organs. If you see wavy white threads amongst the hydroid stems, these are the eggs of Coryphella browni. Photos taken on the Isle of Man and copyright Tim Nicholson, whose underwater photographs and photo books are available from http://www.photoboxgallery.com/timnicholson. View more nudibranch photos on our (new) Pinterest board. In the last three years the number of reported diving incidents has declined by approximately 60 per year. Are people doing less diving, keeping quiet about incidents or diving more safely? Humpback whales work together whilst foraging on the bottom for food - but how do they co-ordinate their behaviour? The answer might be a "tick-tock" song. The first estimate of plastic afloat on the global oceans is a 'highly conservative' 5.25 trillion pieces. The count, which only measures surface-floating plastic, finds its total mass would weigh around 268,940 tonnes - though the vast majority of pieces are smaller than a grain of rice. An underwater robot has enabled researchers to produce the first detailed, high-resolution 3-D maps of Antarctic sea ice. Scientists say the new technology provides accurate ice thickness measurements from areas that were previously too difficult to access. A jolt from an electric eel does more than stun its prey, scientists say. A report the journal Science says that eels can use their electric organs to remotely control the fish they hunt. A crown-of-thorns starfish outbreak has been discovered on the little-known coral reefs of Western Australia's Pilbara region, which are already suffering from severe coral bleaching. Marine wildlife such as turtles and dugongs are still starving to death as a result of Cyclone Larry, Cyclone Yasi and the Brisbane floods, researchers at James Cook University in far north Queensland say. The tiny, single-celled organisms survive in this harsh environment on a low-calorie diet of hydrocarbon compounds and have a very slow metabolism.